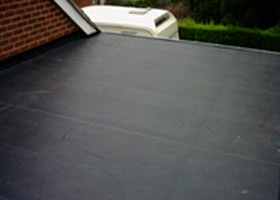 Benefits of a FIRESTONE RUBBERCOVER EPDM Flat Roof - WHY CHOOSE EPDM RUBBER FOR YOUR FLAT ROOF? This list provides a brief list of the benefits of an EPDM Rubber flat roof to our customers. For more detailed technical information Click Here. PROVEN OVER MORE THAN 40 YEARS - You can rely on an EPDM Rubber roof because it's been installed successfully in the USA over more than 40 years. Unlike many other "newer" materials to the UK. Globally, EPDM is the worlds most used single ply roofing membrane. Over One Billion Square Meters of Firestone EPDM has been successfully installed, and is a testimony of pure excellence. SEAMLESS - COMPLETELY RELIABLE - Most residential flat roofs are straightforward rectangles. This means we can install a single sheet of EPDM rubber to cover your roof. This means you don't have to rely on seams to waterproof your roof. Sheet sizes can be cut to fit your residential roof in just 1 piece. We have various roll sizes available. LOW COST BEST MATERIAL AND ECO FRIENDLY TOO - The installed price of your roof will probably be similar to that of a quality felt roof and significantly lower than other "newer" systems. So you can have a flat roof to rely on at a fair price and also be very "green". For example, the conclusion of a report by ACTAC (the Association of Community Technical Aid Centres Ltd) named EPDM as the 'best buy' roofing membrane due to its' low environmental impact in comparison to other membranes, high durability and re-usability. The findings of this report are published in the 'Green Building Digest' Issue 14. For further reference, the Greenpeace publication "Building The Future" names EPDM as the environmentally friendly choice for roofing membranes. Firestone Building Products' commitment to the environment is reflected in the ISO14001 certified Environmental Management System implemented at all of our EPDM manufacturing plants. VERY SAFE INSTALLATION - Because installation is a cold lay technique there is no requirement for any heat, OVERLAY = SAVED MONEY - You don't have to remove your old roof. EPDM Rubber can overlay virtually any old roof so long as your roof decking and joists are sound. This saves you money and saves the environment by reducing debris from the work.